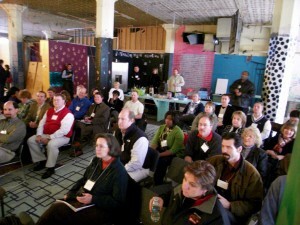 Participants in the Leadership Dayton program toured various arts & culture venues on November 11, 2008. They ended the day visiting the DaytonCREATE Creative Incubator space at 20 N. Jefferson. Bill Pote gave a 30 minute presentation on the creative class theory, the DaytonCREATE initiatives and specifically the Creative Incubator project. 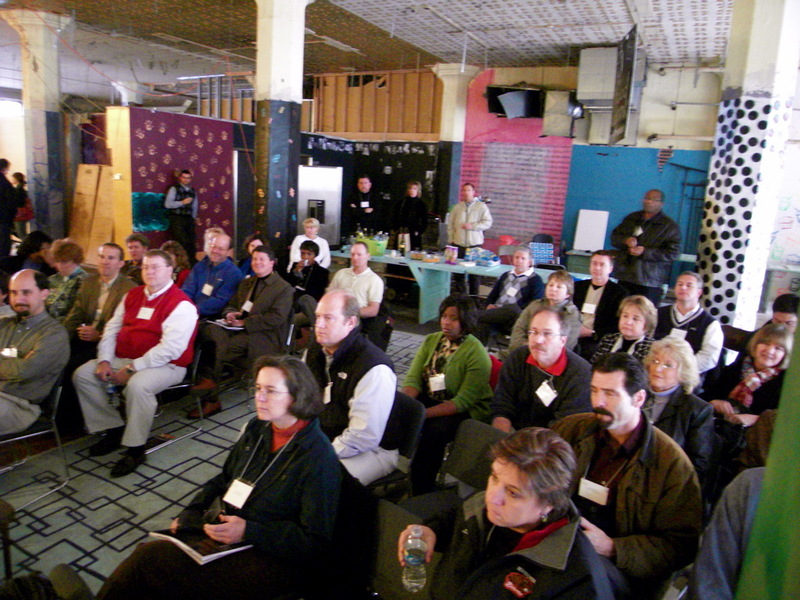 Participants toured the space and heard about past events in the space and learned about the Creative Incubator’s future plans for the group and the space. Next, Mike Elsass gave a presentation on his Color of Energy gallery as well as the rest of the Oregon Arts District. Participants were enthusiastic about what they learned, with many remarking that they had no idea that so many things were happening in terms of Dayton’s grassroots arts. And they were impressed by the “raw” space that had been transformed for LadyFest in September, and inquired about holding their holiday party there in December. The Creative Incubator group was happy to help expose more people to the independent arts scene in Dayton and help convince more people to embrace the urban core of Dayton – an important regional asset and epicenter of the region’s arts, culture and creative class. This entry was posted on Wednesday, November 19th, 2008 at 11:30 pm	and is filed under Creative Incubator. You can follow any responses to this entry through the RSS 2.0 feed.